Last night during my Japanese Woodblock class at MCBA I played with recombining past woodblocks to make a new image. 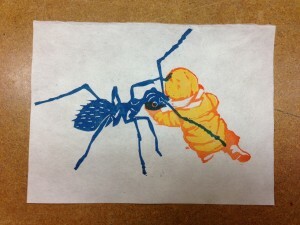 I used the child from “Parking Lot Snow Mountain” and the ant I carved for “Diggers” to make this new encounter between a child an an ant. I printed a few that I will trade with my students for their prints next week.